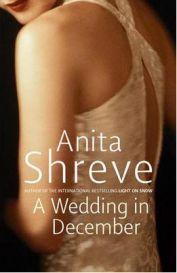 Anita Shreve is a writer I first discovered with her book ‘The Pilot’s Wife’ – a scarily prescient novel about a plane crash with a terrorist sub-plot. Her 2005 novel ‘A Wedding in December’, the first she wrote after the attacks of September 11th, and it was strange to see her return to those events as a subtle circumstantial sub-topic of a much broader tale of private and public loss and grief. Shreve isn’t one of the writers for whom I’d rush out to the bookshop with my credit card burning a hole in my pocket but still she weasels her way into my book shelves, gets read and generally gets passed on to friends that I’m sure will like and appreciate her. She writes good solid novels, filled with yearning and emotion that so far – with the notable exception of the dirge-like ‘All He Ever Wanted’ – have never failed to please me. The month is December and the setting is a small hotel in the Berkshire Mountains of Massachusetts. A group of old school friends meet to celebrate an unusual and hastily arranged wedding. Bridget and Bill were school sweethearts who lost each other, married and had children with the wrong people, and then found one another again at a school reunion. Bridget is dying of cancer and Bill wants to put right the decades he wasted not being with her by getting married. The hotel belongs to Nora, the widow of a famous American poet who is trying to get her life back on track after his death, and trying to become a whole person again after years of abuse living in his shadow. Harrison is a publisher, married to a Canadian lawyer and father to two boys but still carrying a torch for Nora. Harrison is still covering up a secret related to a tragedy that united the group in their last few weeks at school. Will he tell or not? Another person with a secret is Agnes, the frumpy, dumpy spinster school teacher who now works at Kidd, the school that all the protagonists attended. The wedding is particularly hard on Agnes who would like nothing more than to marry her long term secret lover but he’s been stringing her along for many years and still won’t leave his wife. Agnes is torn – should she tell her friends and risk their disapproval but show them she’s more than they think she is? Agnes is also writing a novel – the historical tale of Innes, a young doctor caught up in a tragedy in Halifax, Nova Scotia in 1917 when an ammunitions boat exploded in the harbour causing thousands of deaths and even more injuries. His fictitious story is intertwined periodically with the current-day story. Two of the seven school friends are there with their partners. Brash and flashy Jerry turns up in a stretch limo with his beautiful fur-clad wife Jill but maybe things aren’t as perfect as he’d like them to imagine. Jerry’s having a bit of a personal crisis – he witnessed the attacks on the World Trade Centre, talks about hearing the ‘thud’ of the falling bodies and thinks that nobody who wasn’t there can really understand how it was. Perhaps the most contented of the group is Rob, a concert pianist who has brought along his partner Josh, another talented musician and singer. None of the others knew Rob was gay or even that he was playing piano during their shared schooldays. The ‘ghost at the table’ throughout the weekend is Stephen – the talented baseball player who had been about to go to a top college on a sports scholarship when they last saw him. Stephen was Nora’s boyfriend and Harrison’s room-mate. He played baseball with all the boys and was the life and soul of the party – but also a heavy drinker with an early alcohol problem. Stephen drowned in the sea at a beach party and some of the others in the group know only parts of the circumstances surrounding the death. In addition to the old school friends, we meet Bridget’s son and his friend and a few of the hotel staff – one of whom turns out to have more significance than we would have expected. The book is full of personal and public tragedies without ever getting too morose. The 9/11 attacks are juxtaposed against the Halifax explosion with the reader left to draw their own parallels. Nora has lost her husband but found herself; Agnes has lost her youth and chance to ever have children by choosing the wrong man; Harrison is mourning the loss of ‘what might have been’ with Nora had Stephen not died but is confused about whether what he could gain today would be worth the loss of his current life with wife and children; Bill is all too aware of the possibility that his marriage will be a very short one and also conscious that only by losing his daughter was he able to be with Bridget; and Bridget is scared of death and losing Bill all over again. I couldn’t help but be reminded of films like The Big Chill and Peter’s Friends – the groups of old school friends who find that life has moved on and changed immeasurably and nobody is quite sure who they once were or who they have become. I did find I cared about some of the characters, I wanted read their stories and understand how they intertwined but could see that Shreve was unlikely to go for any conventional or sappy happy endings. A lot is left hanging at the end – but that’s probably more realistic. I found the sub-story of the doctor caught up in the Halifax Explosion to be a bit extraneous to the main story. Whilst it was interesting and reminded me of an historical event that I’d forgotten I knew about, it could have been cut in its entirety without the novel really being any the weaker for its absence. I’ve been to a three college reunions in the years since I left University and I can relate to a lot of the themes of yearning, wondering ‘what if’ and seeing people sizing up their success against their peers. Shreve’s group are all a few years older than me and the people I studied with but I could recognise most of the characters and the emotions covered. I’m guessing that if you are 20 this book will appeal a lot less than if you are 35-plus and it may be more poignant if you had and lost a group of friends at some point in your life. But on the whole, it’s a solid good read that wouldn’t be out of place on the sun-beds and in the flight bags of people looking for a good summer read that’s a bit deeper than chick lit. No Comments on "Skeletons in the Closet"